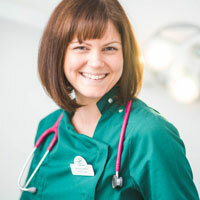 I qualified as a vet from Liverpool University in 2007 and then returned to the South West to work in Cornwall and Bristol before settling in at Wellpets. I enjoy the mix of consulting and surgery and the opportunity for giving continuity of care to my patients. I especially enjoy working in such a small and friendly team. At home I have two dogs and a cat that mean the world to me. I enjoy dog walking in my spare time, especially in the Brecon Beacons.